Throughout my schooling, I have had the opportunity to be involved in a number of children's and youth theatre courses and touring projects. Although my theatre coursework fostered my commitment to educational theatre and drama, nothing prepared me more for working as a professional in the field than the practicum, which involved the practical application of my coursework as I worked with children and youth in the field. The theories, exercises, and curriculum study are, of necessity, the foundation upon which I have built various youth programs, but it is the practicum aspect that I have found to be irreplaceable. 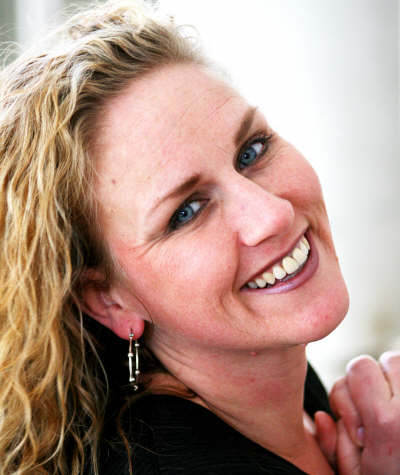 When I took over the Theatre for Youth courses at Western Washington University, I decided to put my practicum theories to the test, and discovered service-learning as a strategy for my drama in education courses. "Everyone who has been involved in the audition service-learning project has been impressed by its success. Some of my students have gone on to recieve coveted and highly competitive internships with the Seattle Children's Theatre, the Mark Taper Forum, and Interlochen Arts." 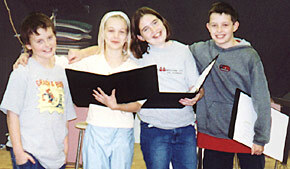 My initial plan was to give an "audition" to service-learning via the Secondary Theatre Techniques course, which focuses on strategies for teaching theatre and drama for middle and high school age classrooms. I chose to start with the one course as a test-run because I wanted to incorporate practicum experience at the advanced level. The Theatre for Youth courses are required not only for Theatre Arts majors choosing a concentration in Youth Drama, but are also required for College of Education students desiring an endorsement in Theatre Arts. Looking at the demographics of the class (the almost 50/50 split between theatre people and non-theatre people), I decided to get them working together in mixed groups in the community, directing and script-coaching a showcase with high-school age students. The "audition" turned out to be a model for permanent performance. Everyone who has been involved in the audition service-learning project has been impressed by its success. Some of my students have gone on to receive coveted and highly competitive internships with the Seattle Children's Theatre, the Mark Taper Forum, and Interlochen Arts. Students who can add service-learning experience to their resumes have an edge on those who do not. As I provide references to potential employers for my students who have gone through the program, the consensus is that those students who participated in service-learning not only have the necessary hands-on training, but also demonstrate better communication skills, organization skills, and understanding of the position for which they are applying. Because of the positive response from my audition service-learning project, I chose to find a way to incorporate the service-learning practicum into each of my five Theatre for Youth courses. My next job was to figure out how to integrate service-learning into courses as varied as Creativity across the Curriculum, Children's Theatre and Secondary Techniques, and the Multicultural Outreach Touring Project. By definition, Theatre is action; it is collaboration and creativity at its best. The "CPR" of learning�Creation, Performance and Response�is a vital aspect of drama in education, and service-learning addresses all three areas of CPR. The first step of interweaving service-learning into the courses was to simply make the community aware that this opportunity was available. The Service-Learning Center at WWU is a tremendous resource for creating a web of contacts throughout the region. We also sent a general mailing to area schools and key groups detailing the upcoming opportunities for upper-division WWU students and to provide unique and inventive activities in the schools. There was an even greater need to offer arts-supportive curriculum to youth in the area because of the cut-backs in arts funding. A course syllabus and sample materials were sent with each mailing, along with my business card and flyers to put in teachers' lounges. The response has been positive and energizing as the community becomes aware of the vast wealth of skill, creativity and energy the college students can bring to their groups and classrooms. The WWU students are enthusiastic about these opportunities to test out their lesson plans and activities (Creation); the youth participants are eager for outlets in creativity (Performance); and the teachers and leaders have been providing wonderful feedback to the students coming into their classrooms and youth group settings (Response). Knowing that WWU is willing to help and reach out to the local theatre community has made my job as a high school drama teacher more rewarding. It has been my desire to get my students more aware of what skills and talents are required for the higher education programs and working with Western has given me that opportunity." After contacting the schools, I needed to integrate service-learning into the syllabus itself. How does one evaluate it? How does one find the time? How does one incorporate service-learning into an already existing course and make it worth-while for all involved? The answer (for theatre and the arts especially) is simple: ask yourself specifically what areas, lectures or activities you are teaching that can translate into hands-on experiences for your students? Are there activities in the course the students could replicate without too much difficulty? Is there a way to create a model that the students can easily follow which will give them a sense of confidence, the program a sense of structure, and the community involved new knowledge? I have found that the answer is always "yes!" What the CPR of Service-Learning does is channel the enormous talent and energy of college students and fits it in with needs in the community�resulting in a win-win situation for all involved. In our case, this is the positive and healthy theatre of community and community as theatre. How does one evaluate it? Teachers and leaders in the community can share evaluative rubrics with the course instructor, thereby giving the college students and participants an opportunity to respond to the overall project. For example, the Secondary Theatre Techniques course has a midterm and final evaluation rubric, as well as a final reflection journal and documentation of performance from both the Western students and high school participants. The Creativity across the Curriculum course also requires teacher evaluation and written journal reflection/documentation at both midterm and finals. The positive aspect of service-learning is that the instructor is not "locked in" to any one evaluative approach, but can design the service-learning projects to suit the specific classroom abilities, pace, and focus. How does one find the time? If the service-learning project is an on-going one (more than a single or two-time meeting with community participants) I have found it helpful to put the service-learning students into groups to work as a team in bringing theatre to the community setting. The collaborative nature of the art form we're involved in also demands skills in small group communication and creative compromise. Inherent in group structure is peer review and support, and coupling that with response and evaluation from the instructor as well as the participants provides a very well-rounded learning experience for the students. There may be grumbling at first over scheduling woes, but the end result has always been a greater understanding of the value of the practicum. The students in the Secondary Techniques course work in groups of 3 or 4 directors to a ratio of 4-12 participants in an after-school (or in-residence, depending on community involvement) schedule, several hours per week. Once the practicum has begun, their in-class meeting time is divided up so that each student, rather than spending four hours per week in the course, spends an hour per week with me to problem-solve and trouble-shoot their service-learning project. This addresses another concern about students spending too much time relative to the credit hours received for the course. This also provides students with valuable one-on-one time with the instructor. In my case, the Center for Service-Learning at WWU helped to make the initial transformation from a hypothetical classroom to an actual setting in the community. The Center provided materials, coaching and guidance, as well as assigning me my own student coordinator to smooth the way into the community organizations and to take care of all the details (which are what at first may seem so overwhelming) such as clearance forms and evaluation procedures. All in all, redesigning the Theatre for Youth courses has been a positive experience that was made easier by the implementation of service-learning. During the first year that I used service-learning in my courses, the Secondary Theatre Techniques class worked closely with the Center for Service-Learning to provide residencies to three community groups: The Martin Center, Sea-Mar Visions, and The Boys and Girls Club of Bellingham. The community groups were all very different, and the initial reaction of the WWU students was�not to mince words�abject terror. Although many of them had worked as directors of their peers and even youth, none of them had worked with at-risk teens. The Martin Center is a lock-down psychiatric unit for troubled youth ages 12-18. Sea-Mar Visions is an in-residence rehabilitation home for young women ages 12-18 with histories of drug and alcohol abuse. The Boys and Girls Club, seen by my students as the "safest" of the groups, was set up specifically as an after-school program for low-income, potentially at-risk youth. 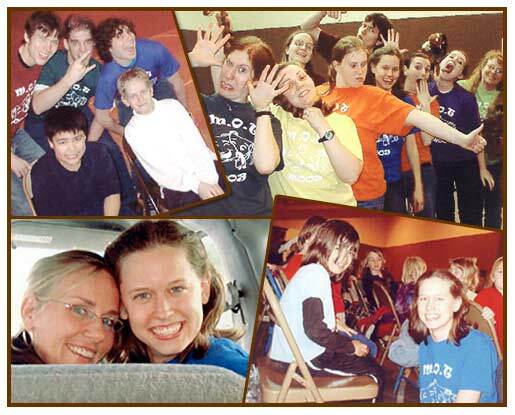 "I went to Sea-Mar Visions for a hands-on experience developing devised work with [at risk] youth. However, I discovered our visits were less about the end result and more about drama being a tool for building self-esteem. �One young girl never appeared to enjoy herself and I assumed she didn�t take anything away from the experience. But she shocked me when she revealed that� she was proud of herself for finally finishing something she started. ... All I know is that it was a very personal experience that I value so much. And no one could have given me that experience but those girls. They made me remember how hard it is to be a young woman and how having support from someone makes a big difference. Their spirits were inspiring and I couldn't help but care for them. I still often think of them and hope they're doing well." This year, the Secondary Theatre Techniques class partnered with Sehome High School for their practicum project. The course culminated in a showcase performance for peers, parents and the entire class of WWU student directors. The plan for the future is to continue the service-learning projects. I want to combine the community groups (such as The Martin Center) and the local high school opportunities for service-learning, so that the WWU students in this course can have the range of experiences those two venues can provide. The Children's Theatre class was lucky enough to partner with the Seattle Children's Theatre to experience some of their teacher training programs. These advanced level students brought their skills into 2nd through 4th grade classrooms at Lowell Elementary School in Bellingham, where they directed reader's theatre pieces and conducted specialized workshops. "Service-learning provides an opportunity to practice your skills, learn from your mistakes, and just see what works. More importantly though, the opportunities [in the] theatre education classes have taught me some much needed and important lessons in perspective. We sit in our classes all day long and learn things but, until you see a child�s face light up and their mind really engage because of something you showed them, it doesn�t mean a whole lot. Experiencing first hand the effect that these activities, and I myself, can have on a child helps me remember that all that I�m working to learn is worth while. Seeing that I can actually make a difference puts "the heart" back into what I want to do and helps give more meaning to the everyday work I do here on campus." Future plans for the Children's Theatre course include continuing to have the upper level students in the community doing service-learning projects, with added attention to community as well as groups of Kindergarten through Fifth Grade students. Creativity Across the Curriculum is the course most geared toward future elementary teachers. It focuses on integrating artistic and creative approaches (using Gardner's Multiple Intelligence Theory as a framework) to various areas of the curriculum. The course could be viewed as the most theoretical and classroom-oriented of all the Theatre in Education courses offered at WWU, and the opportunities for service-learning at first appear slim. However, the practicum aspect of these courses has been successful in this course as well. The students are required to do both a midterm and final service-learning project in which they test skills and lesson plans generated in class. The future goal for this project is to create a greater connection with service-learning for the upper level students who are ready for more in-depth projects. This year, their final project is one of their choosing (subject to instructor approval) which integrates their previous coursework with a larger practicum commitment, focusing heavily on the "CPR" aspect of learning. This year, the Theatre Arts Department was lucky enough to provide resources for the Multicultural Outreach Touring Project, a two-quarter theatre for youth endeavor that culminates in a touring performance for schools and community groups in Whatcom and Skagit counties. The performances are free of charge for participating organizations, and the WWU students involved earn a total of 6 upper division credits toward a concentration in Theatre for Youth. Because the tour is set up as a class, and the resources consist of recycled fabrics and materials, the total cost of the entire tour is based on transportation and a few incidentals needed. The WWU students have been involved in every aspect of the touring production, from researching and selecting the multicultural folktales that were dramatized, to building the masks, puppets and numerous props, to creating original curriculum support materials for the participating schools. The upper-division students then provided in-class follow-up to the show by visiting classrooms and performing some of the support material activities with students in elementary grade classrooms. The Multicultural Outreach Tour not only is a fun service-learning project, but also answers many of WWU's "Quality Goals" (see the President's Strategic Action Plan). My future hope is to expand the tour to include additional community organizations or site-specific target groups. I expect to work closely with the Center for Service-Learning to achieve that goal. As the connection between service-learning and theatre for youth grows, I have every confidence that the education of both WWU students and their community partners will flourish as well.